Championship races are notorious for their cautious tactics and resulting slow times. They are often agonizing to watch as the runners run well below their normal pace and the tension builds. Afraid to make the race for the others, no one is willing to get in front and push the pace. Today's Commonwealth Games 5000 in Delhi was just such a race. The winner -- Moses Kipsiro from Uganda -- came home in a relatively pedestrian 13:31.25. That's a full 41 seconds slower than his career PR. He ran 13:00.15 in June of this year. Likewise, Eliud Kipchoge came second today in 13:31.32, despite his 12:46.63 PR and a 2010 time of 12:51.21. With the top guys executing a sit-and-kick strategy, and with no rabbits to provide a proper pace, the race today was painfully slow. As a result, Adrian Blincoe's time was likewise well off his PR of 13:10.19, and he did not respond off the slow pace. He finished in 11th place in 14:03.07. All things being equal, Adrian should have been in the mix with Collis Birmingham and Ben St. Lawrence, who finished in 13:39 and 13:45, respectively. Adrian Blincoe said the six days he spent in Hong Kong preparing for the Games wasn’t enough to adjust to the heat of Delhi and he paid the price. “I just underestimated the affect of the heat, I didn’t get myself over to a hotter climate early enough and I paid the price out there,” he said. 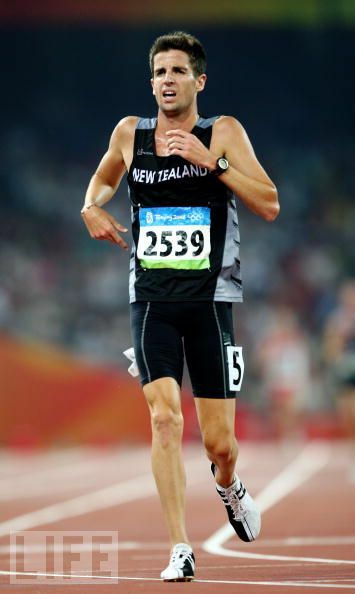 The New Zealand national 5000m record holder, at 13m 10.19s in Belgium in 2008, kept up with the winner Kipsiro and three Kenyans for nine of the 12.5 laps but with 1000 meters to go he “really hit the wall hard”. On the positive side, Blincoe is competing at 1500 meters as well later in the week.